Please, can you add some button to SELECT/DESELECT (check/uncheck) all companies which we own!? For us, citizens this will be good thing. Don't tell me to install some scripts i don't like unofficial scripts! Plato forever! Viva credit cards! Reset my safety code (i sent more than 10 tickets about this)! Edited by sajberstoneman, 09 July 2014 - 02:01 PM. 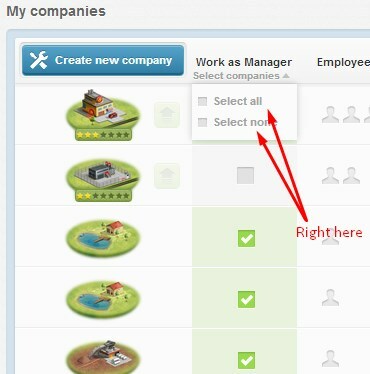 If you want to select/deselect specific kind of companies, you will have to do it manually. Hahaha, i'm playing this game long time and i never saw that. Amaizing!